Ian tried to warn me. I half listened to him. I was really, really looking forward to have a "real" Christmas. The first real Christmas for us. Real meaning the whole shebang - decorations... a Christmas tree... etc. Unfortunately as Ian predicted, our building does not allow live Christmas trees. Very sad. I will NEVER buy a fake tree so don't even suggest that option. A tree is what makes it a real Christmas. The lights, the smell, the ornaments... I had my heart set on having the full holiday experience. I still love that Ian and I will be together in our own place for it. But I wish we could have the whole thing. We're trying to breathe life into this $4.00 Cedar plant I got a few weeks ago. 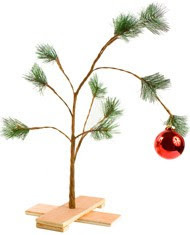 It's not doing so good because of the cold... but it could serve as Charlie Brown Christmas Tree for us. It makes me miss my mom's house. Oh just sneak one in!!! You could get like a 3 footer and put it in a box and bring the box in!